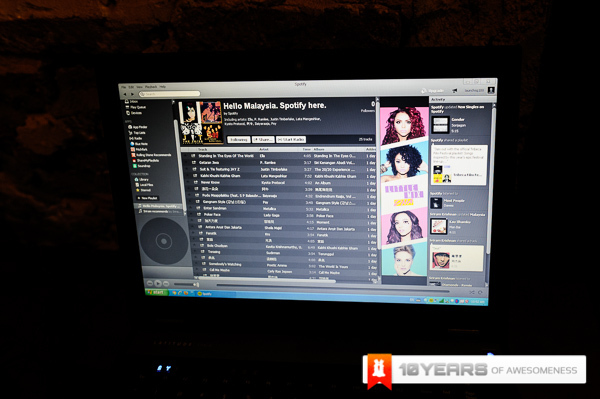 After years of teasing and forcing Malaysians to go through a VPN just to access the service, Spotify is finally available in Malaysia. The leading music streaming service from Sweden now opens its 20 Million track database to Malaysians for absolutely nothing. Spotify’s free service allows you to stream just about any song in the world for absolutely nothing, inserting an audio ad every few songs or so to keep things even. Just so your friends know what you’re listening to, Spotify plays very well with Twitter and Facebook as well as its own social network of sorts. Where Spotify really changes things is when you subscribe to their premium service. At RM14.90 the subscription is the cheapest that I’ve heard of across the board and that is so that we are given an “affordable option to piracy”. With the premium account, you get no ads, the ability to download your tracks to a mobile app so you can listen to songs on the go as well as enhanced sound quality. The Spotify app is available on iOS and Android as well as the desktop version. Go get your free account today at http://www.spotify.com. While you’re there, get yourself some Premium too! Look out for a Lowyat.NET Music Of The Month Playlist Coming Soon!